This afternoon’s entry in the “Why This Book Should Win” series is from writer and Russian translator, Andrea Gregovich. She also interviews literary translators about their new books for the Fiction Advocate blog. Writing why Tómas Jónsson, Bestseller should win the Best Translated Book Award is like trying to describe a bizarre, exhausting dream that felt important but wound up buried too deep in your subconscious for words to make sense of now that you’re awake. As I was reading this beautiful mess by Iceland’s Guðbergur Bergsson I kept thinking to myself, how is this even a book? And how did translator Lytton Smith not descend into madness bringing it into English? This isn’t hyperbole, the book is that much. It’s a monumental piece of work in a meta sort of way, and that’s why it should win the BTBA. 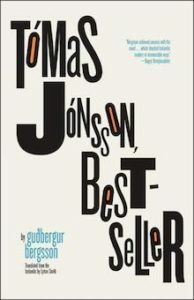 Tómas Jónsson, Bestseller is ostensibly a collection of fictitious notebooks written by a cranky old man with a mind full of literary brilliance and egotistical bitterness, a man with a lot of opinions who is generally ticked off about everything. Even though the book is printed in a standard typeface, it reads like journaling. It’s full of errors, has a haphazard page layout, and its elderly ramblings are often barely penetrable as they weave in and out of the fragmented Iceland stories and intellectual manifestoes. Sometimes the narrative switches recklessly from one topic to another without warning—I swear it switched mid-sentence at one point, but now I can’t find that part to tell you about it. As I was looking for this passage I did, however, find a page on which Tómas is complaining about the cat and right in the middle of his anecdote for some reason is written, “(something is wrong with the text here).” I also found another funny section where he’s unhappy about the kitchen habits of his tenants and says, “This is ugh and yeuch, Bubbi.” A big part of reading this book is noticing these foibles, laughing and baffling over them, and usually not finding a clear explanation for them. Instead, you just accept their absurdity and recognize that they are weirdly wonderful. Your own personal collection of these odd buried treasures is, I’d say, what you can look forward to taking away from your reading of this strange book. I’m sure fictional character Tómas Jónsson, who is very much concerned with his literary image (the title tries to claim itself a “bestseller” after all), would not have wanted these notebooks published in the state of shambles they’re in. And that’s part of the book’s wild charm: it’s one of Iceland’s twentieth-century literary masterpieces, and yet it captures the exact opposite of, say, a poised and polished tale of Vikings or fairies (as an English-language reader might try to expect out of Iceland). Iceland is sloppy, frustrating, and grotesquely authentic in this book. It’s the literary equivalent of sneaking away from the tour guide taking you past all the tidy and respectable historical monuments in Reykjavik and instead venturing into an apartment building on a side street and peeking through a keyhole into the gritty, authentic domestic life going on in there, with its chamber pots, chipped dishes, laundry messes, and smells of soup. But that metaphor doesn’t go far enough—you’re looking not just inside an apartment, but deep into the mind of the man who owns it, which becomes a rare glimpse into the psyche of Iceland itself. In trying to describe Bergsson’s book, I feel I’ve written an inevitable word salad, perhaps not dissimilar to the salads of Tómas Jónsson himself. I don’t think I’ve really gotten to the crux of why this book should win the BTBA, which aims to award both the book and the translation. So on that point: imagine what a labyrinth of rabbit holes and mayhem this book was for a translator to contend with. How did he even know what was happening from one sentence to the next!? How does one faithfully translate a text that borders on impenetrable into something that can be even be read? Lytton Smith not only got the job done, he did it with humor, nuance, and beauty. He let the crazy stuff be opaque and difficult, but also depicted those scattered moments of poetic beauty and philosophical wisdom with the artful language necessary for a reader to discover them amid the textual chaos. He also made sure the silly parts about cats, chickens, and chamber pots came through with the punchy cadence they deserved. So the translation is a feat in and of itself, and the book finally finding its way into English is a triumph of Iceland’s literary community, which has kept Tómas Jónsson, Bestseller, originally published in 1966, from slipping off the radar and into obscurity all this time (as you might expect such a loose baggy monster in a relatively obscure language to do). I’ve not read all of the finalists, but I’m confident no other translation vying for the Best Translated Book Award in 2018 simply is what it is with as much vigorous impossibility as Tómas Jónsson, Bestseller. Not even Fever Dream. Even if this paragraph amounts to more word salad, let that vigorous impossibility be the reason this book should win.